AVALON — The Catalina Island Conservancy’s fox recovery program brought the endangered Catalina Island fox back from the brink of extinction in less than 15 years, resulting in a population of more than 1,700 in 2014. However, more foxes mean more interactions with humans, and those interactions can be dangerous for the foxes. In 2014, at least 25 foxes died from vehicle trauma, poisonings and other interactions with humans. In 2014, the conservancy documented 21 fox deaths associated with vehicle trauma – more than died from all other causes among the deaths that biologists were able to documented last year. Biologists believe many more foxes die from vehicle trauma. But their deaths simply go unreported or undetected because the fox is not wearing a radio collar or does not immediately succumb to its injuries while on the road. Other human-related causes of death in 2014 included two foxes that drowned in uncovered water containers, one that was chased and bitten by an unleashed dog and one that died as a result of ingesting rat poison. Illnesses led to the deaths of another six, and nine deaths are listed as unknown, either because the carcass was too decayed or the necropsy has not yet been completed. In many cases, the dead foxes are found in locations near trash cans, leading the conservancy to launch a new program this year to purchase animal-proof trash and recycling containers to protect the foxes on the 42,000 acres it stewards. Trash cans with no lids or broken lids are “attractive nuisances” that lure foxes from their natural habitats and food sources to these unsecured trash containers, causing the foxes to cross roads or hang out near roads. Avalon Canyon Road and other roads around the perimeter of the city abutting wildlands are noted for their high incidences of fox mortalities. The nutritionally deficient trash itself can also be harmful to the foxes, and the tiny creatures have become trapped and died inside the older trash cans. The 80-gallon containers require the user to reach inside a covered area to unlatch the lid and open it. The lid then swings shut when the user releases it, securing the trash or recycled materials inside and keeping wildlife out. Altogether, an estimated 150 new animal-proof trash and recycling containers, at a cost of nearly $2,000 each, will be needed to replace all of the trash cans on the land the conservancy stewards and in a few high-risk areas in Avalon. 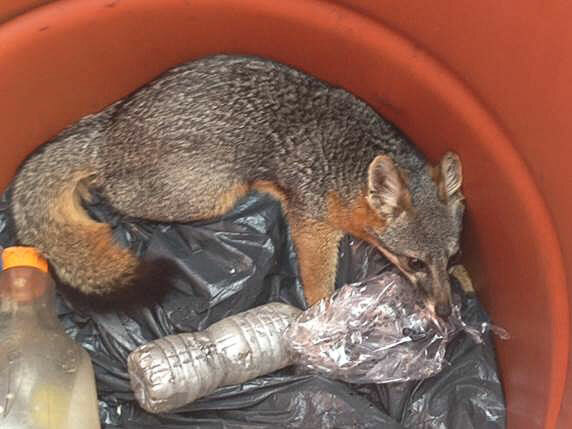 The conservancy is raising funds to finance the purchase and installation of the new animal-proof trash receptacles because they’re needed to protect the Catalina Island fox. The conservancy also has erected signs along particularly perilous stretches of road to remind motorists to reduce their speeds and remain vigilant, especially at dawn and dusk when foxes are more likely to be present. It’s placed additional signs at trailheads and specific staging areas to remind the public not to feed foxes. The conservancy also has expanded its education and outreach efforts to increase the awareness of Island residents and the visiting public about ways to reduce the hazards that may impact the foxes’ survival. The conservancy’s wildlife biologists have been closely monitoring the foxes since their numbers plummeted from about 1,300 to just 100 in 1999 because of an outbreak of canine distemper virus (CDV) likely brought to the Island by a stowaway raccoon. An adaptive management program – which included captive breeding from 2001 to 2004, vaccinations against CDV, translocations and monitoring – restored the fox population to more than its pre-crash numbers.